In October last year my father received the news that he would no longer be given the medication that had kept his liver cancer under control for two years. While we were waiting to be seen by his consultant, I discovered I was successful in the ballot for this year’s London Marathon. It was a bittersweet day. The London Marathon is so difficult to get into through the ballot – more than 400,000 people applied for less than 18,000 places! The odds of getting in are less than one in twenty. At the end of April I’ll be heading south to where my marathon bug began back in 2014 and I’m raising funds for the Beatson Cancer Charity, based in Glasgow. My father passed away in November, two weeks after he stopped getting his medication, but the care he received at the Beatson West of Scotland Cancer Centre was fantastic. Medication that was meant to only be effective for three months ended up being effective for two years, and he managed to do so much in the time that he had. London wasn’t my preferred choice of location for this year – that honour would go to Boston as it is the only one of the six majors (the two I have mentioned plus New York, Chicago, Berlin and Tokyo) that I’ve still to tick off the list. Boston is the most difficult to get a place in as it’s the smallest in terms of the number of competitors, but I’ll keep trying every year in the hope of becoming one of only 3,000 or so people in the world to have completed all six majors. In the meantime I hope to continue doing at least one marathon every year to keep myself ticking over! I started running as a hobby in back in 2012. I ran the Glasgow 10k that year and the following year, before completing the London Marathon in 2014. I ran New York in 2015, Berlin and Chicago in 2016, and took a break in 2017. 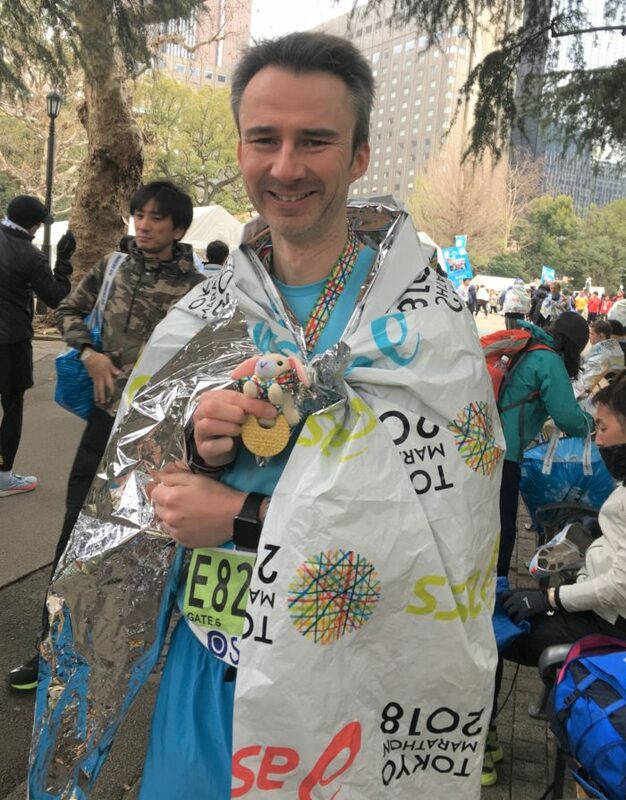 Last year I completed the Tokyo and Loch Ness marathons and you don’t get much more of a contrast going from one of the biggest, busiest and most polluted cities in the world to the calm, quiet and fresh air of the Scottish Highlands! If I had to pick a favourite it would be Berlin as the route is fantastic. It takes in all the sights you would want to see in the German capital and the finish line is through the Brandenburg Gate and into the Tiergarten. The beer at the end is simply an added bonus. When I started running marathons I would train six days a week but I’ve reduced that to three now, mainly because I’m getting older. Training six days a week was also very intense and I probably couldn’t go back to that. If I was asked to give one piece of advice to someone thinking of getting seriously involved in running, or doing a marathon for the first time, I would say it’s important to listen to your body and not push yourself too hard, especially at the beginning. Build a solid foundation and don’t try too much too soon. Stephen is taking part in the Virgin Money London Marathon on Sunday April 28 to raise funds for the Beatson Cancer Charity to help them continue supporting cancer sufferers and fighting this terrible disease. Click here if you would like to support Stephen’s fundraising efforts and remember to use Gift Aid! Beatson Cancer Charity supports people affected by cancer, every step of the way, making the journey easier by transforming the way cancer care is funded and delivered. The charity provides services, as well as funding specialists, research and education to invest in a better future for cancer patients and their families.